The nine surface ships which the Argentines then had at sea could not attempt to match or challenge the fleet of 44 British warships. The bombardment of Port Stanley by the newly-arrived Task Force on May 1st wreaked a toll of 56 Argentine casualties. Argentine President Galtieri was ‘stunned by the impact of the day’s attacks’ (G&R81). ‘It was on that day too that Argentina’s top generals and senior officers had called on Galtieri to sue for peace because the nation’s armed forces were in no position to wage all-out war against the British.’ FAC 28. Belaunde phoned Galtieri from Peru at 23.30 Saturday night Lima time (1.30 am Sunday in Argentina), outlining his proposals, and explaining that he needed a definite decision from Argentina by 10 am Washington time, when Haig would be meeting Pym – that was the deadline. A further phone conversation took pace at 10 am Argentine time (2 pm BST) and concerned the four nations that were being consulted (Peru, Germany, Brazil and US). Belaunde said to Galtieri: ‘I called Haig, and he in turn told me that Britain was objecting to Peru’s membership.’ The implication here, is of UK input. A final draft of a treaty was prepared by officials who had been at work in the 18th century Torre Tagli mansion, headquarters of the Peruvian Foreign Office, since the early hours. It was drawn up for signature by the British and Argentine Ambassadors in Lima. “On an academic fare I went to Peru, spent an hour and a half with Belaunde Terry and he explained in detail in his office in Lima what had happened: that, first of all, the proposal was for Peruvian and American troops. But the Americans weren’t acceptable to the Argentines, nor were the Peruvians acceptable to us, and therefore arrangements were being made for Mexican, West German and Canadian troops.’ . ..He [Belaunde] said to me, “I know that your government and your Prime minister knew exactly what I was doing.” And he said, “One day there will be the documentary evidence.” (TD 31) Dalyell also visited Manuel Ulloa, chairman of the Development Committee of the World Bank and the Prime minister of Peru, who told him: “I know that through Lord Hugh Thomas and others, that your government and your Prime Minster knew precisely what we were doing that Saturday and Sunday.” Paul Rogers confirmed that Ulloa was in touch via Lord Hugh Thomas both before and after the sinking, from Mirror journalist Mike Reed who was residing in Lima. 97. Look, you have to understand that the whole government of Peru came to a halt that weekend, we were so concerned. And what Oscar Mauortua said was, “We were concerned both at the Task force coming and at the prospect of battle and the fact that your Task force we knew was bringing nuclear weapons which was an infringement of Protocol One of the Treaty of Tlatalolco which you yourselves had signed. “I was in constant phone contact from about midday that Saturday until well into Sunday 2 May 1982 with both the Argentine Ambassador in lima and the British, Charles Wallace whom I know very well. I phoned each several times from my office to their homes, advising them of every step in our peace negotiations. Wallace, a conscientious man, gave me the clear impression that he was referring back to London all the time.” (phone interview Jan 1984, Gavshon & Rice, in FAC, p.38). Arias Stella also revealed [in a talk with Dr G Makin, in New York May 1984] ‘that the Peruvian Ministry of foreign Affairs had drawn up a memorandum summarising the several telephone conversations and meetings in Lima relating to the initiative and that this summary proved to his mind that the British government knew of the plan by the midday of Saturday May 1st, when he called both the Argentine and the British ambassadors to his office to inform, on President Belaunde’s instructions, of the state of the negotiations involving Alexander Haig as a go-between with the British Government. Costa Mendez ‘who isn’t the most agreeable of persons, or the most credible’ [Dr Makin] informed me as the Junta’s Foreign minister at the time of the conflict, that the Peruvian plan had been accepted in principle by the military and this decision was communicated to the Peruvians in the understanding that it was being relayed to the British foreign Secretary. The reason, he held, for this acceptance was that the Haig initiatives allowed the British to retain possession of the Islands as it was envisaged that they would be under British administration. This was unacceptable, according to Costa Mendez, as there was then no guarantee that there would ever be any substantive progress. “In addition to a truce, the Peruvian initiative consisted of a withdrawal and a handing over of the administration of the islands to an international committee manned by representatives of countries acceptable to both parties in conflict. Given a date it was possible to reach a final agreement (the date was 31 December 1982). “On the evening of Saturday, 1 May the Army Council, some 60 generals of senior rank with more immediate powers over their member of the junta than a constituency Labour Party has over any MP, cajoled or persuaded th”e dipsomaniac, alcoholic Galtieri to agree to order the Argentine forces back from the Malvinas. It was the army that mattered, but Admiral Anayan, the naval member of the junta, had ordered his fleet back to port…. The tidings of Galtieris’ decision to withdraw were indeed passed to Washington, and were quickly sent to London and the Prime Minster.” (Thatcher’s Torpedo, p.22). Al Haig’s Memoirs stated; ‘Acceptance was gained in principle from both parties.’ ‘Secretary Haig had the clear impression on 2 May that British acceptance of the Peruvian proposal had been achieved with only a few key words still to be agreed. 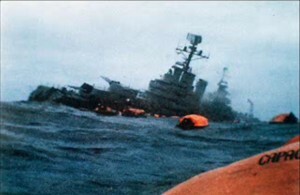 When news of the destruction of the Belgrano came in he was asked by his press spokesman Dean Fisher, ‘But I thought we had a deal?’ According to members of his staff he replied, ‘We did.’ (FAC, p.35). Did Britain know of the peace proposals? Cecil Parkinson Chairman of the Conservative Party was interviewed on Panorama (19.4.84): ‘Pressed by Emery, Mr Parkinson let the cat out of the bag. “Yes” he said, “we knew all about peace proposals that Saturday morning, primarily those of President Belaunde.” And when I had the opportunity of pressing Cranley Onslow, then minister of State at the Foreign Office, he said “Well the Foreign Office knew all about the peace proposals on the Sunday morning.”’ (Dalyell, p. 32). James Prior in his memoirs A Balance of Power wrote that accepting the Peruvian peace plan would have split the Conservative Party: ‘If the Peruvian plan, or UN plan, or Haig plan had been agreed and a negotiated settlement ensued in early May, there would have been a wholesale revolt among Conservative backbenchers with up to 60 members revolting and I think up to 30 refusing the government whip. Now bearing in mind that the Conservative majority at that time was only 35, then Prior is saying that his opinion is that the government would have fallen if it had tried to go for a negotiated settlement’. (Paul Rogers, p.111).